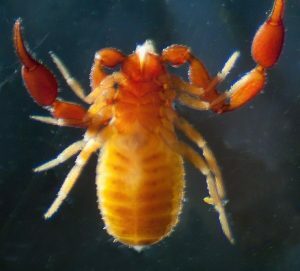 The cephalothorax and pedipalps are red-brown and the opisthosoma yellow-brown; the cephalothorax is strongly granulate, longer than broad and with two distinct transverse grooves. Eyes are absent. Length of body: 2.2–2.3 mm. Allochernes powelli is found in W. Europe: England, Denmark, NW. Spain. There are scattered records from England and Wales where it is probably under-recorded; it has not been recorded from Scotland. This mainly synanthropic species occurs in barn and stable refuse. 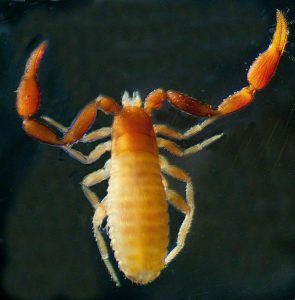 Further information see Mark Harvey, Pseudoscorpions of the World. Unless otherwise stated all images are Copyright of Gerald Legg, naturaimaging. If you would like to use any images, then high resolution ones can be obtained by contacting me.